I love an author event. I love seeing writers sharing their moment, their pride, their secrets. I love an event in my home town, where we can be home in time for the rest of our evening. 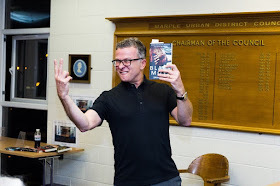 Strangely, this was the first time I've been to such an event at Marple Library, but where David Nolan has started, I hope there will be more. For a start, he spoke so well, so powerfully and was so compelling that we not only bought this book but his investigative books on the St Ambrose child abuse scandal. I'd already read the Tony Wilson biog when it came out. 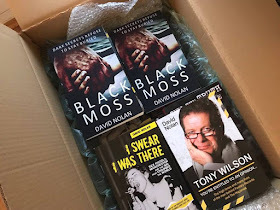 While Black Moss is a fictional story, there is a solid grounding in reality. 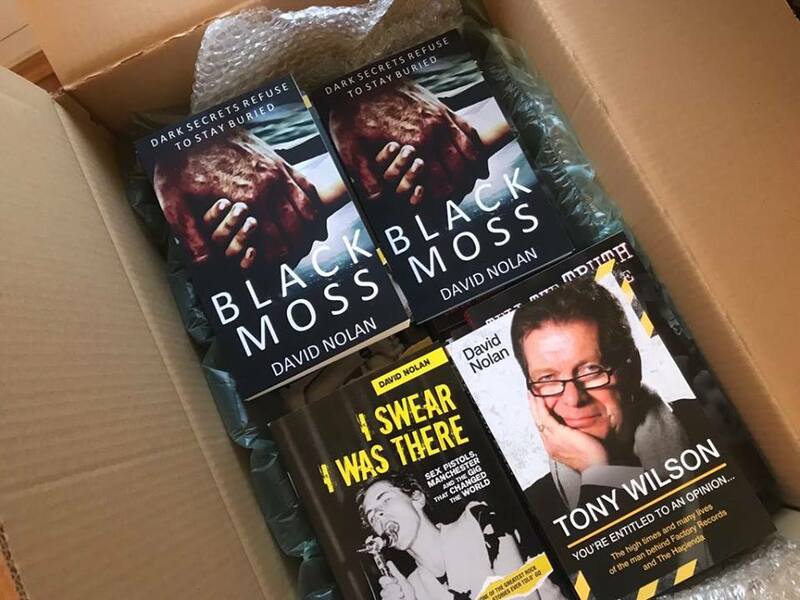 The background is important, David Nolan was writing a book on the complex and murky world of abuse scandals - particularly kids in care homes and the existence of a dossier into high profile paedos held by former Saddleworth MP Geoffrey Dickens. Dickens was always dismissed as a bit of a buffoon, but the hard truth, we sometimes discover, is stranger than anything we could dream up. The revelations about what was going on in Rochdale, for instance, have been truly shocking. David's publisher didn't think the book was worth him finishing so paid him a kill fee. He turned that disappointment into an inspiration for a story about an unsolved child murder, committed in plain sight at a time when the news media and the police were obsessed with the Strangeways prison riot of 1990. Using a major event to hide a crime was the root of I Am Pilgrim - Terry Hayes' sprawling espionage thriller, set against the aftermath of 911. This tale is far more locally focused, intensely so, and he uses devices to show the time and place to great effect. They are best when they are subtle - speech and behaviours - rather than what was playing on the radio. The attention to the detail of Manchester and Oldham's changing topography is also highly skilled, while he clearly had some fun settling a few old scores with the depictions of characters from a barely disguised Piccadilly Radio newsroom, or even a Tory MP called "Peter Jeffreys". But the tale is one of isolation and rather sparse emotions - a central character with flaws, a monstrous ego, but also an impatient hunger to right a series of wrongs. The eventual plot twist is ballsy, I'll only say that, but the journey to get there is driven by a writer with a real feel for the pace of a story. An excellent first foray into fiction.